Italian collier ship seized by Allies. The Royal Navy begins escorting British and Commonwealth troop convoys from Egypt to Greece. German reconnaissance planes locate the British convoy PQ-12 bound for Murmansk. General Sir Harold Alexander arrives at Rangoon to take over command of Burma Army from Lieutenant General Hutton. Wavell had given Alexander orders to hold Rangoon at all costs. Immediately, orders were issue for the 1st Burma Division to counter-attack the Japanese from the north and 17th Indian Division which had be reinforced was to attack east of Pegu. Both attacks failed and Alexander realized that Rangoon could not be held. He ordered that Rangoon be evacuated and his troops withdraw north to the Irrawaddy Valley to regroup. Koniev’s 2nd Ukrainian Front launches an attack towards Uman. 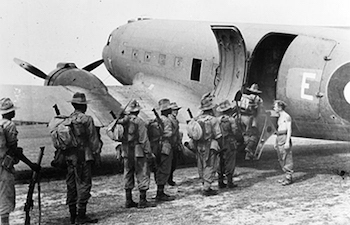 Gliders and air-transport-borne ‘Chindits’ set up ‘Broadway’ a stronghold behind Japanese lines, North East of Indaw. Advance patrols of the U.S. First Army reaches Cologne. Germany is now conscripting 15 and 16-year-olds into the regular army.